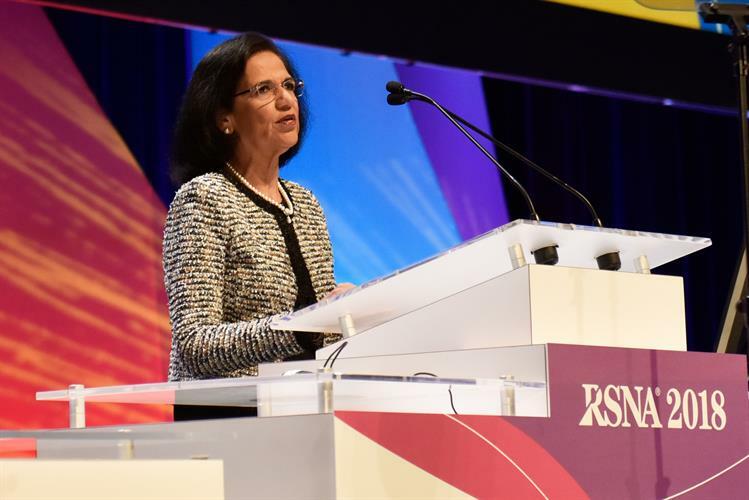 November 26, 2018 -- CHICAGO - Radiology can once again situate itself at the center of patient care by embracing emerging technologies such as artificial intelligence (AI), RSNA 2018 President Dr. Vijay Rao said in her opening address. Radiologists must do their part to make this future a reality. "We will need to embrace AI rather than fear it," Rao said. "We will need to recommit to the patient-centered model of radiology ... develop the necessary ethical and medical-legal procedures for protecting data as well as machine-learning algorithms ... [and] form cross-sector partnerships with our colleagues in other specialties." RSNA 2018 President Dr. Vijay Rao. Such efforts should be geared toward building a transformational framework for the profession -- one that will allow the next generation of radiologists to thrive, she noted. This will help shape the future of radiology into one in which "radiologists have been empowered by technology, not replaced by it." "It is a future in which radiologists' capacity to provide improved patient care has been dramatically increased," she said. "And finally, it is a future in which we have achieved our long-standing goal of practicing at the epicenter of care, providing value to both the patient and our physician colleagues." The rise of digital imaging, along with the lack of interoperability of systems, the shortage of radiologists, and physician burnout, in recent years has contributed to an increase in demand for value-based imaging, according to Rao, who is the David C. Levin professor and chairwoman of radiology at Thomas Jefferson University and hospitals. AI and machine learning have emerged as a means of meeting this demand -- potentially enabling radiologists and other clinicians to harness the large amount of complex imaging data available even more effectively, she noted. Yet the rapid growth of these technologies has also spurred a sense of concern and even fear in the medical community. "However, I don't believe AI will ever replace radiologists," she said. "In fact, much the opposite: I believe more firmly than ever that AI has the potential to enhance the profession and transform the practice of radiology worldwide. It'll allow radiologists to spend more time on initiatives that will benefit both patients and physicians." Establish digital diagnostic data hubs. With the help of AI, radiologists can rebrand reading rooms as diagnostic data hubs (as they once were in the past) in which various clinicians can make patient management decisions collectively through virtual conferencing. Radiologists could also use AI to aggregate imaging findings with other relevant information such as biopsy findings, lab results, and patient genomics. Patterns drawn from the comprehensive data could lead to a diagnosis that otherwise would have been missed on imaging in isolation. This could serve as the foundation for advancing personalized medicine, she said. Provide total imaging care for patients. Emerging technologies may give radiologists more opportunities to discuss imaging findings with patients and ensure follow-up imaging, instead of relying on referring physicians to complete these tasks. "Everyone says radiologists should be more patient-centered, but very few radiologists are doing it," Rao said. "I believe we have to start doing all of these things to take over the total imaging care of patients. The good news is that AI and related technologies give us the tools we need to finally make this a reality." Envisioning the future of radiology in 25 years, an AI savant will greet radiologists when they sit down at the reading station, Rao continued. They will then see a list of cases for which a fully automated AI algorithm has suggested the appropriate study, having previously scanned the patient electronic medical record (EMR) for important information. This process will help radiologists quickly understand why a particular exam was ordered and what to look for next. Also in this future, advances in technology will shorten times for MRI exams to less than 10 minutes, dramatically reduce CT radiation dose, and provide built-in image quality control measures to reduce repeat studies. Furthermore, AI will highlight urgent studies -- such as one in which a patient's new imaging exam reveals significant changes from previous exams -- and send notifications directly to the radiologist's phone for time-sensitive critical conditions, Rao said. AI-driven decision-support tools will integrate evidence-based recommendations into the radiologist's report as they mine patient-specific data in real-time. This will allow radiologists to examine temporal relationships of pathological findings on images in the context of clinical, genetic, and therapeutic information -- empowering them to create comprehensive imaging reports. In addition, patients will be able to see the radiologist's information at the bottom of the report and recognize that radiologists are, indeed, real doctors. "AI's most important impact on radiology will be to enable us to work more efficiently and effectively," Rao said. "This will, in turn, mean that we will have more time for so-called nonproductive activities -- the kinds of activities that will enhance our visibility in the patient care continuum." The workload efficiency afforded by AI algorithms may allow radiologists to spend 90 minutes or more per day meeting with patients and discussing imaging findings with them, she noted. "In 2043, radiologists will have realized that if they truly want to be recognized as physicians who provide patient-centered care, they have to leave their reading rooms and interact with patients directly," she said. In the past, the central hub of the hospital was not the C-suite or the operating room but the reading room in the radiology department, Dr. Michael Recht from NYU Langone Medical Center said in his oration in diagnostic radiology following the president's address. Serving as the central hub allowed radiologists to truly be the doctor's doctor, and this led to great satisfaction and sense of purpose for radiologists, he noted. More recently, however, the introduction of PACS, cuts in reimbursement, and increases in workload have threatened to change radiology into a commodity -- endangering the entire specialty. "I believe that through the creative use of technology, we can create new value and help return radiologists to their central role in the clinical care team, thereby increasing our purpose and sense of satisfaction," he said. Recht suggested several measures to help drive this return to form, including hosting virtual consults that allow for real-time interaction with images; embedding reading rooms; developing an app that would serve as a platform for patients to schedule their exams on their own, view their medical images, and communicate with radiologists; adding images directly into annotated reports; and constructing radiology-pathology correlation modules that track all of the radiology reports at an institution to unveil systematic trends in decision-making. "If this comes to pass, radiologists will be integrators of a wealth of information about the patient, not just the imaging information alone," Rao said. "They will become key figures in leading a team of physicians in decisions about diagnosis and treatment options for the patient, including image-guided therapy. ... There couldn't be a more exciting time to be a radiologist."